Never Worry About Running Out of Pet Food Again! Would you like to save 10% on your next order, and all subsequent orders from Metro Pet? All you have to do is sign up for our AutoShip program and you can enjoy 10% off all of your pet food and supplies as long as you stay enrolled in the Auto Ship program. Our AutoShip program allows you to receive shipments automatically on any time interval you choose. You can cancel, suspend, or change the next ship date at any time, providing you the ultimate in flexibility with your order. 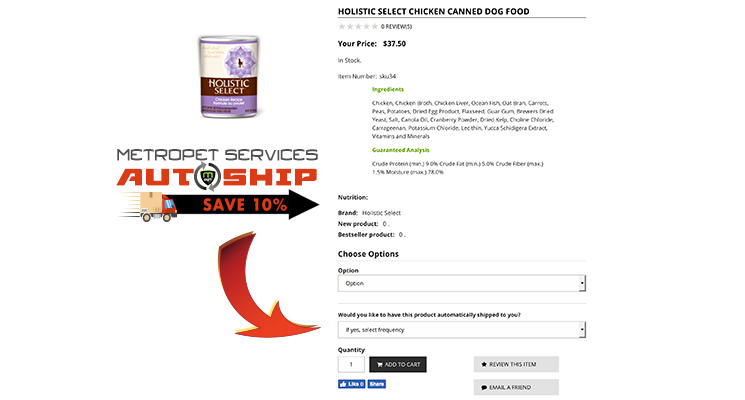 It's easy to get started, when selecting your pet food products, below the product options, simply choose the interval in which you would like your product shipped (see picture below). It's that simple! If you have any questions you can call us at 1-866-290-7387 and one of our customer service representatives will be happy to assist you. It's easy and can save you alot of time and money! !